Myself and Dr. Jeremy Schmoe from Minnesota Functional Neurology saw a growing need in the brain injury community for more awareness and education about alternative healthcare methods and modalities for those who are still suffering from the lingering effect of brain injury. The week of June 5-9th the summit will provide you with over 20 of the most renowned specialists in the brain injury community, including doctors, caregivers, survivors, and other clinicians who are experienced in successfully treating brain injury. The lineup includes: David A. Grant, Jennifer Tavernier, Sachin Patel, Doug Schmidt, Dr. Ryan Cedermark, Richard Frieder, Dr. Jill Schultz, Dr. Michael Lewis, Judy Chase, Dr. Mike T. Nelson, Dan Sexton, Kyla Pearce, Dr. Allie Wagener, Jamie & Braden Benz, Dr. Deborah Zelinksy, Dr. Sam Yanuck, Dr. David Traster, Dr. David George, Cristabelle Braden, Cavin Balaster, and Dr. Nathan Keiser. 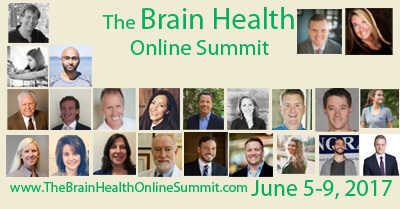 The 2017 Brain Health Online Summit is ideal for: Brain Injury Survivors, Caregivers, Loved Ones, Co-Workers, Healthcare Providers, and anyone interested in their overall Brain Health Function. And best of all — it is completely FREE! If you’re not able to attend all of the dates, no worries! Recordings will be available for purchase with a portion of all proceeds benefiting the Brain Injury Association of America.